We are a member of the Ann Arbor Independent Athletics Association. Here are the member schools and locations. All students participating in sports must complete the athletic participation form and commitment form. These must be returned to the school before the sport starts. 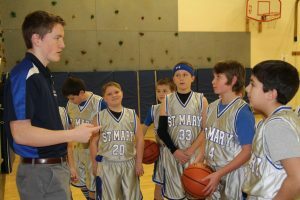 St. Mary’s Athletic Director, Scott McGlade, was facing a difficult situation. The school’s fifth and sixth grade boys were ready to begin the J.V. basketball season but he was still looking for an experienced assistant coach. His search ended when the news reached veteran players Thomas Tarske, Ryan Burke, and Bob Salowitz. 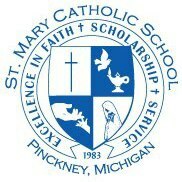 Upon hearing the news of a possibly having to cancel the season, all three St. Mary Pinckney alumni committed to volunteer to coach. 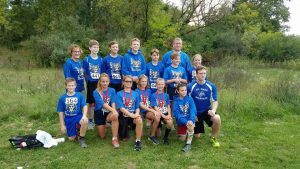 Pinckney, Mich., October 6, 2018: The St. Mary School cross country team finished with eight medalists on Saturday at the annual A2 Run Co Coaching Legends Classic at Huron Meadows in Brighton. Almost 900 competitors represented 16 area schools. Erin Stuk had the best finish among 7th-8th grade girls, placing first out of a field of 109 runners. In all, eight of the 11 Wildcats runners medaled by placing in the top 75 event finishers. The Robotics’ Program will transport teams into space, where students will explore, challenge, and innovate in the vast expanse of space. Students who participate in First show a substantial increased interest in STEM (Science, Technology, Engineering, and Math). Participates demonstrate a higher understanding in STEM and are more likely to participate in more challenging math and science courses in high school and college. The core values of FIRST® are Discovery, Innovation, Impact, Inclusion, Teamwork, and Fun. To learn more about First Lego League Challenge, please visit https://www.firstinspires.org/robotics/fll/challenge-and-season-info. Costs for the program will be $2500.00 for our two teams. If you would like to help bring this exciting program to our school children, please email Mrs. Kinsey at mrskinsey@stmarypinckney.orgor call the school office at (734) 878-5616. The St. Mary Catholic School in Pinckney will be offering its students FIRST LEGO League Robotics for the first time. FIRST LEGO League teams research a real-world problem such as food safety, recycling and energy, and are challenged to develop a solution. They also must design, build, and program a robot using LEGO MINDSTORMS. 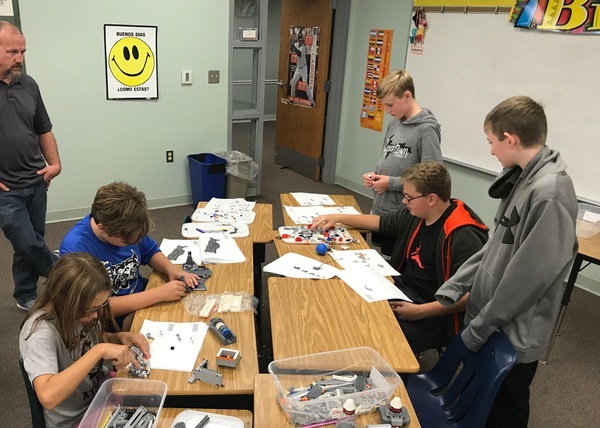 School officials say FIRST LEGO Robotics is fun for students while they learn to apply science, technology, engineering, and math concepts (STEM), with a dose of imagination to solve a problem. Robotics is also said to help students develop critical thinking and team-building skills and basic STEM applications, in addition to practicing the program’s core values, which emphasize discovery, teamwork and good sportsmanship. St. Mary School officials say interest and participation in FIRST LEGO Robotics has been strong. 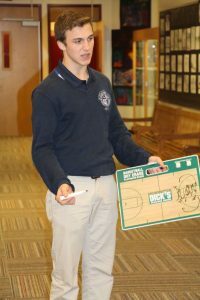 The school has four teams, led by parent volunteer coaches, with two teams made up of Kindergarten through third graders, and one team each made up of each fourth and fifth and sixth through eighth graders. Teams will go through the process and compete in a limited number of challenges this first year. 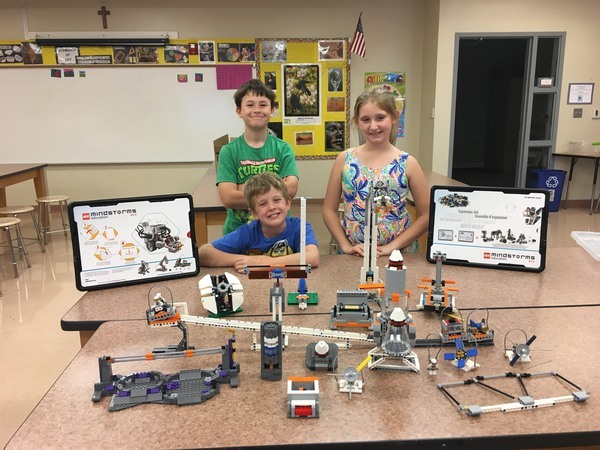 Principal Veronica Kinsey says, “FIRST LEGO Robotics has generated a real buzz in the school”, adding that both students and parents have shared in the excitement. 2) Left bottom and around: Madison Cooke, Grace Lackey, Mr. Caldie, Trenten Caldie, Joseph Moltane, and Peter Hilliard.